What would be the first confirmed chemical weapons attack of the Syrian conflict (if confirmed, and it's not the first allegation) was reported on December 7, 2012. It came in the form of an unsupported allegation by the opposition Local Coordination Committees of “toxic gas” being “thrown” the day before in the Damascus suburb of Daraya, site of the largest mass-killing yet in August's Daraya massacre. It came as fears had been growing for a week over the Syrian government's alleged preparations for using Sarin nerve gas, and following statements suggesting that the United States would have to militarily intervene if the government engaged in any chemical attack. Just what the gas was, and what evidence there was for it being used is unclear. It was somehow being seen as drawing strength from credible same-day reports of the use of white phosphorous, which is not a chemical weapon. It remains to be seen whether this allegation (or the one two days later) is deemed to have crossed Washington's "red line." The LCC documented 248 points of shelling, 13 points were shelled by warplane (the fiercest was in Damascus Suburbs), 2 points were shelled by Cluster Bombs and 4 points by barrel bombs. The regime forces shelled Mohasan and Buomar by Phosphorous Bombs and threw toxic gases in Daraya. A video is shown, labeled "Aftermath of Missile Shelling in Daraya, Damascus Suburbs." None of this gives any details or support for the free-floating claim of toxic gasses. It could be nothing more than a strange translation error or typo. Strangely, the SOHR report for the day that made no mention of Daraya was topped with an image from there (see inset) that will be familiar to some. This is a still from one of a few videos of four ostensibly dead boys wrapped in white on a truck bed. The images first emerges in late August, in the days just before the government re-conquest and their alleged massacre (see the first paragraphs here). 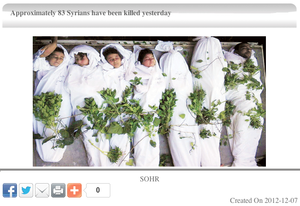 How such an image from came to be re-used that day, when nothing was reported (by the SOHR) for Daraya is unclear. However much evidence there is or isn't for this LCC claim of a Daraya gas attack, it seemed to make total sense jammed as it was after talk of white phosphorous used to the east. "The regime forces shelled Mohasan and Buomar by Phosphorous Bombs," apparently near Deir Ezzor,the largest city in Syria's desert east. This allegation seems to be true; the LCC provide three videos to support the claims. Warplanes Equipped with Phosphorus Bombs Flying Over Mohasan, Deir Ezzor: A helicopter flying. No proof of claim. The Moment Phosphorus Bombs Landed in Mohasan, Deir Ezzor: White smoke spreading in a mid-distance orchard. Faint jet sounds are heard near the end, but no proof what the smoke is or that it was from a dropped bomb. Regime Helicopters Fire Phosphorus Bombs on Mariyeh, Deir Ezzor: Here's the pudding with the proof (barring video fakery, however likely one might find that). A high-flying helicopter fires a burst of white smoke lines, seen at 0:33 arcing down, with glowing tips. 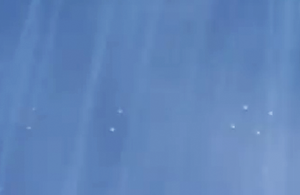 Whether that's white phosphorous or something quite consistent with it we can't be certain, but there are dozens of glowing white, smoking tablets coming down in a fan formation, with two larger bright spots in the middle. See inset for a detail on some of these; the doubling is apparently a motion blur. "Allahu Akbar," the narrator repeats, in one of its non-triumphant meanings. A chemical substance has been deployed. In Mariyeh, it seems, someone flying a helicopter (usually government forces, to put it softly) fired white phosphorous on December 6. Reflecting this back on the previous two videos, the claims made about the same in Hohassen become more credible, if not as clearly proven. As fears grow that Syrian President Bashar Assad may use chemical weapons in a desperate move to quell a 22-month uprising, members of the opposition claimed Friday that the regime is already using internationally-banned chemical agents in the war. As supporting evidence, apparently, they also cited Captain Abdul Salam Abdul Razaq, a self-described defector "from Syria’s chemical warfare unit" told Saudi paper A-Sharq Al-Awsat that chemical agents were already used several times in the war. These alleged gassings, which seem to have left behind little or no credible evidence, were "primarily" done with two agents: mustard gas, and sarin. This page was last edited on 28 March 2013, at 22:39.